Sergio's Museum presented by Theatre  opens tonight at The Barons Theatre on Main Street. Afterloves: Love Lives in the Afterlife is co-created by Louisville native Betsy Reisz, and she has brought it home to The Bard’s Town for this weekend only. Montage Lives! Our Artistic Past Informs The Future opens at 1619 Flux Art+Activism today. If you don’t know what “Montage” was then you should come to this event. Opening Reception--Artist Talk for the Secret History of the American River People exhibit at The Portland Museum. Young Picasso, directed by Phil Grabsky, is at Speed Cinema this weekend. 1 Night/4 Artists/Pop-Up/Fri. 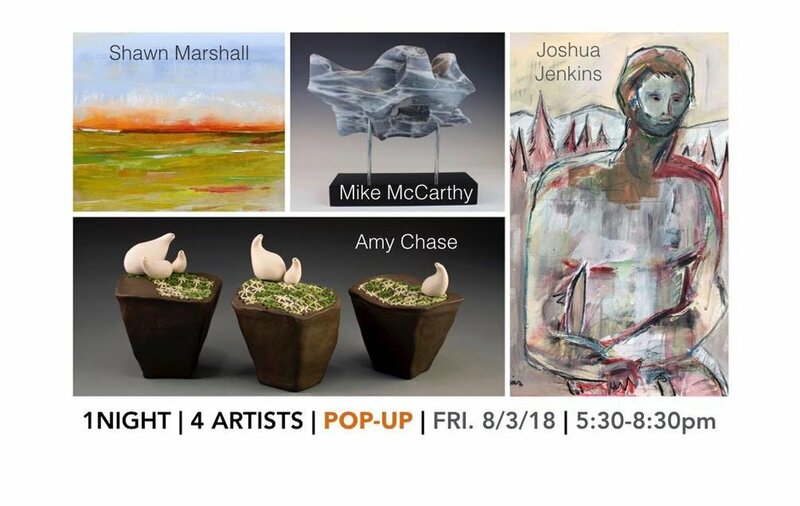 8.3.18/5:30-8:00pm will showcase the work of artists we like a lot: Shawn Marshall, Mike McCarthy, Joshua Jenkins, and Amy Chase. Carnagie Center for Art & History opens Spawning Grounds. First Light Gallery opens Reborn by Rebecca Rose tonight, with a reception 5-9pm. Larry Beisler opens a new exhibit at garner narrative. Suspend Productions will be the pre-show in Central Park with Fabled Fragments Chapter Three: A Wizard In The Woods. It will be followed hard upon by Louisville Ballet's Tempest. Both productions are FREE. Speed Cinema begins screening Edouard Deluc's new film Gauguin: Voyage to Tahiti. Henri-Georges Clouzet classic 1955 film, The Mystery of PIcasso opens at Speed Cinema Sunday. Shayne Hull: Politicians and Flesh, is on exhibit at Swanson Contemporary. Pyro Gallery opens John McCarthy's Nature in Play and Susan Moffett: A Retrospective. Douglas Miller and Karen Weeks are exhibiting together at Lenihan Sotheby through the summer. And you can view Douglas's MFA exhibit at Cressman Center for one more week. U of L's Photographic Archives is open for Louisville Underground Music. Chloe Lee's exhibit at Surface Noise.